Aunty and I have gone a little further than usual this week. No, we didn’t take the wrong turning! After spending a night in the Hilton Hotel in Gatwick, we boarded the plane for Trinidad for a two week holiday that also includes Tobago as well. We’ve both been looking forward to this for a longtime as it’s our 25th wedding anniversary in the next few days. Packing start a full 3 days before we were due to fly. Aunty was determined to be prepared for all eventualities from tracking through the rainforest to lying on the beach, with dress up dinners in between. We’d already had our yellow fever vaccinations about a month ago, luckily without any side effects. The bags were packed full not only of clothes but we also had enough any mossie sprays, bite relief remedies. I think we have enough to set up our own pharmacy. But I’m sure at some time I’ll be glad Aunty was once a girl guide. 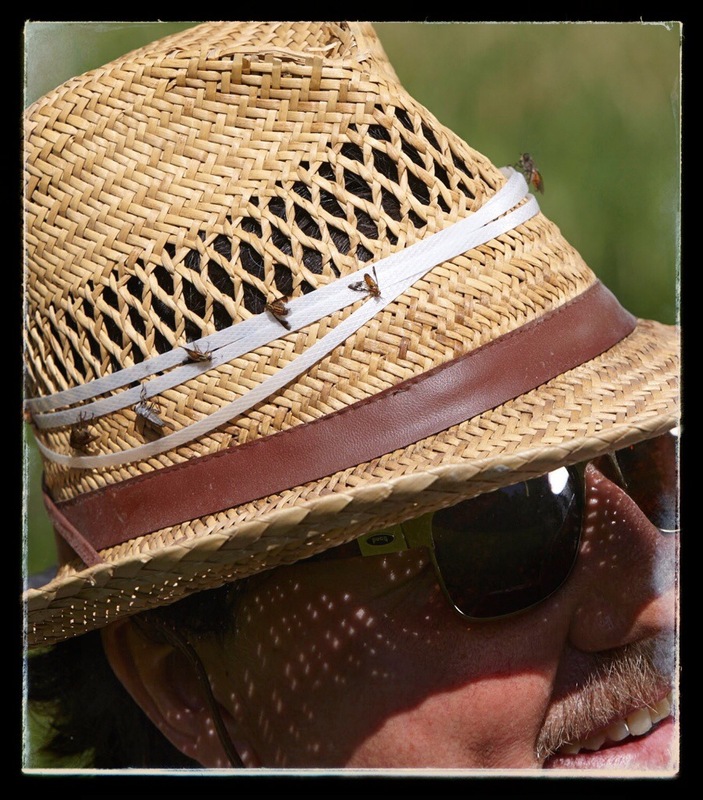 If hand pharmacy fails we could always put fly paper around our hats instead maybe. The flight took over ten hours, but this did include a stop off at St Lucia. All of a sudden the plane was empty as most of the passengers got off with the crew. Then it filled up again from the 40 minute flight to Trinidad. Our first 5 nights are at the Asa Wright Nature Reserve and Lodge. 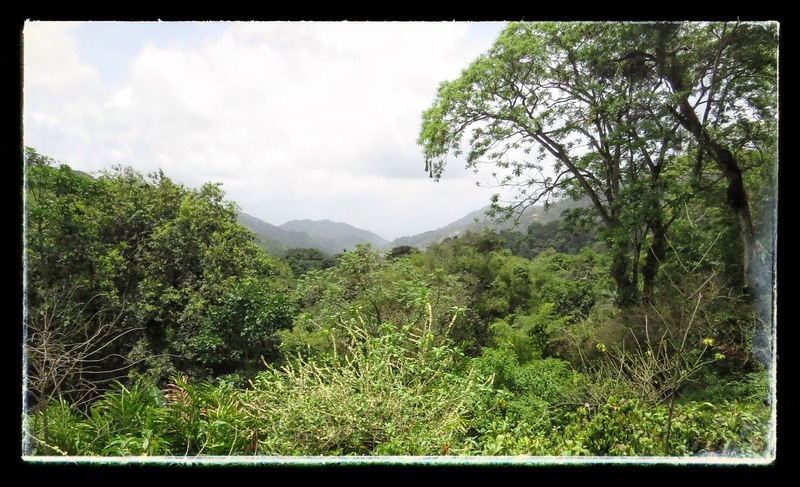 This was a coffee and palm plantation but after the war with increasing interest from naturalists because of the fantastic wildlife in the valley it became a nature reserve. We are staying in the old plantation house with a huge room and an antique shower. Working out how the shower worked was a major challenge. Turning the hot and cold taps seemed to create a random stream of hot or cold water. It was either too hot or too cold. At times I had to resort to evasive action as I jumped about in a unique version of a Morris Dance. With the unerring timing of the Challinors we arrived just as the evening rum punches were being served. So with punch in hand we had a superb view from the veranda down the valley looking over the tops of the rain forest. Because of the time difference with huge UK we were wide awake at 5am and out on the veranda for tea and bird watching as the dawn broke. You don’t have to be a bird watcher to be here, the place is fantastic! The birds in all their glory are right there in front of you, with humming birds visiting sauger feeders less than a foot away. My face is aching from wearing a smile all day! 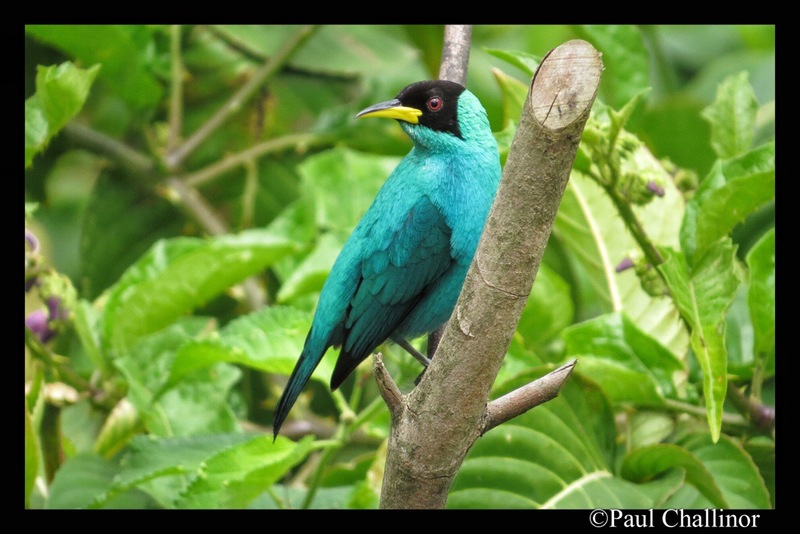 The Green Honeycreeper is my favourite bird for today. After breakfast we were given a short orientation tour and then left to our own devices to wander around the trails. Again being Challinors we decided on huge Adventure Trail. Now I don’t think many people take this trail! 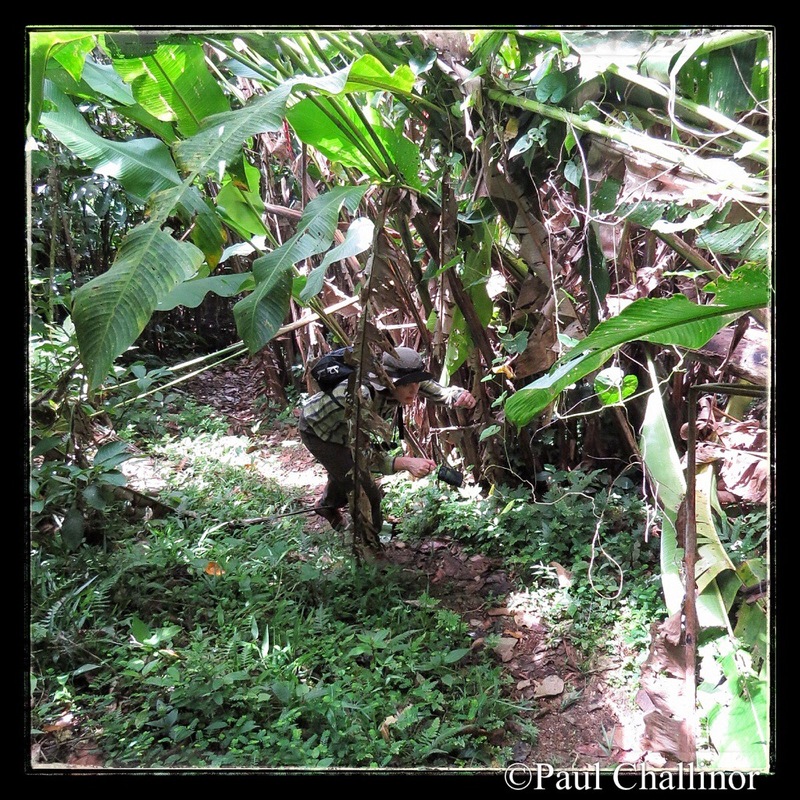 But after a few “Dr Livingstone I presume” moments we finished it and because we have psychopathic tendencies we then went onto the Bamboo Trail. 3 hours later we emerged onto the road and staggered back to the Lodge for lunch! 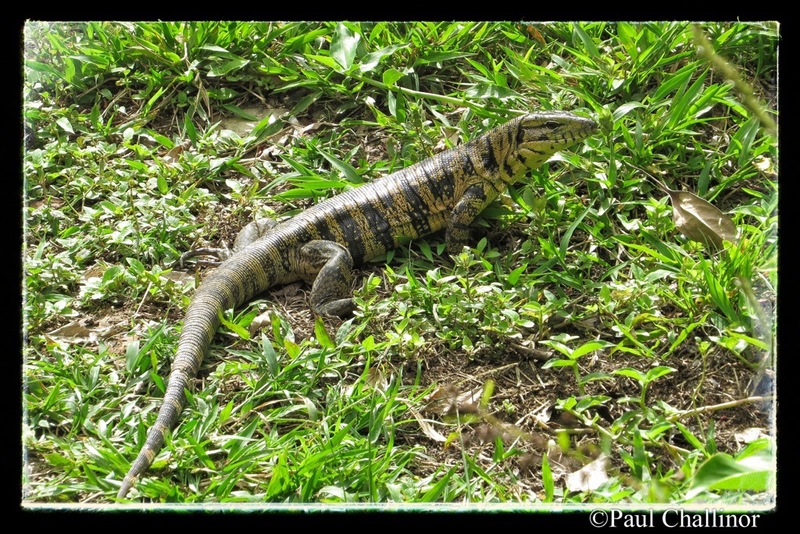 The Tiger Lizards are common here, and we seen a few already around on our wandering a. However, they’re not the most macho of chaps. We’ve watched them being chased and harassed by a couple of mocking birds. 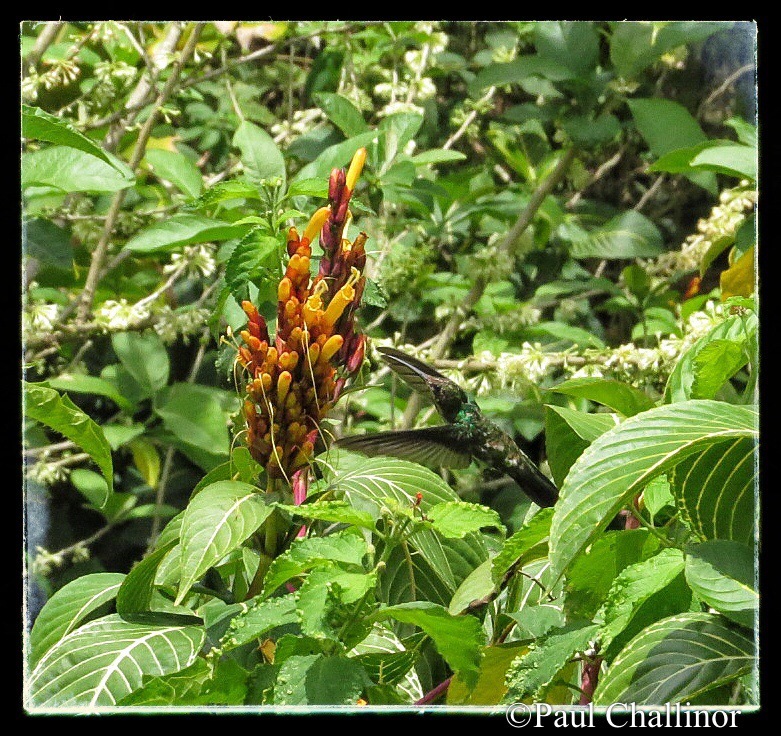 There are lots of humming birds around the lodge and they don’t have move, so it’s a challenge to get them in frame. I’ve got lots of photos of where they were, only showing empty branches. This is a female White Necked Jacobian. I’m going to try and get the male tomorrow. It’s not only the birds that have fantastic colours, but the flowers are also superb. 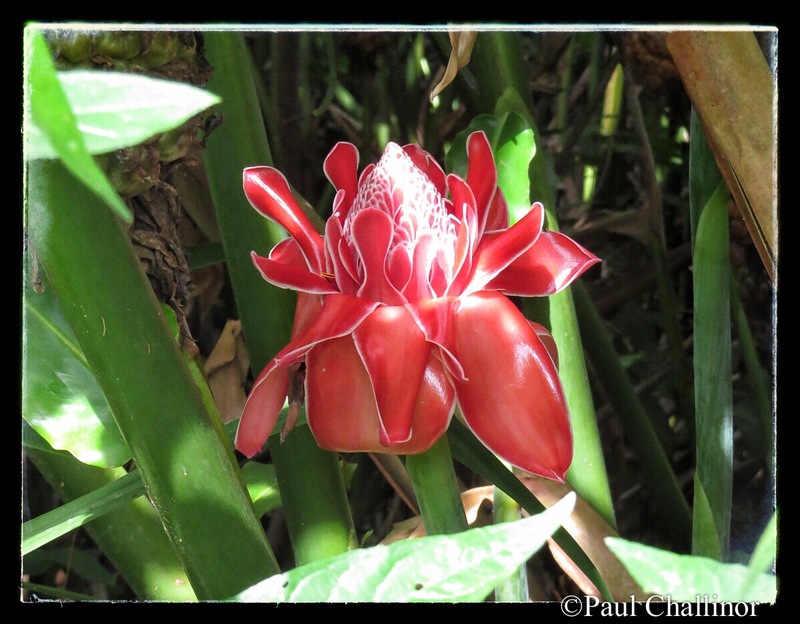 The Hawaian Torch Ginger is just one we came across fighting our way through the rain forest (sounds impressive eh?). More to come I hope. I’m still smiling!!!!! It all looks so green and lush. I’m dead jealous! Previous Previous post: How high can we go? To the top of Pen Y Fan!